Let our 7 ft. Super Stork welcome home the new mom & baby! 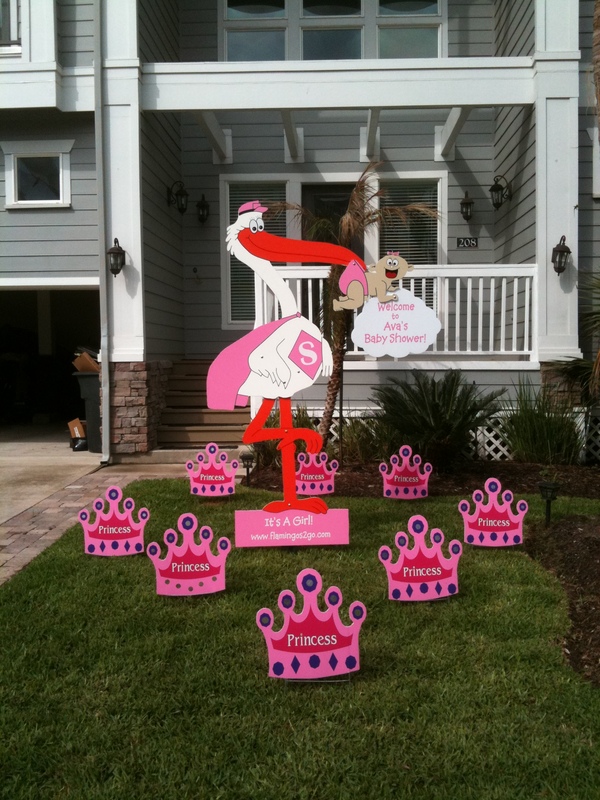 Rent one of our cute Stork Yard Signs! The neighbors & visitors will be sure to smile each time they drive by or visit! 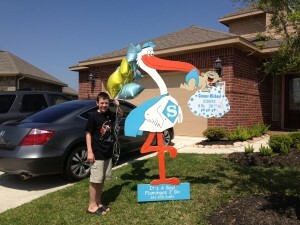 Photos with the Stork and new baby will be treasured memories for years to come. 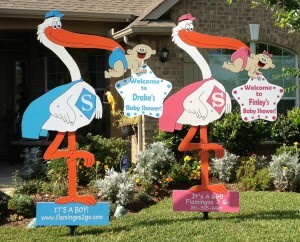 Our Stork Yard Signs are available in Pink or Blue Storks. The keepsake heart is left for your enjoyment at the end of the rental period. 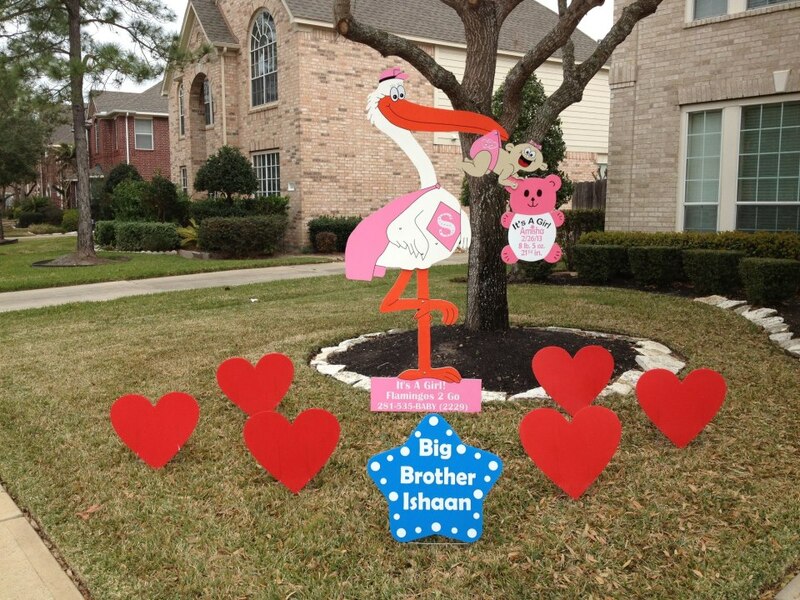 Our Stork Yard Signs come in Baby Girl Pink or Baby Boy Blue with a matching baby hanging on by the stork’s beak, and a personalized, keepsake star, heart or cloud. All of the materials are made from professional, outdoor, weather-proof vinyl material. 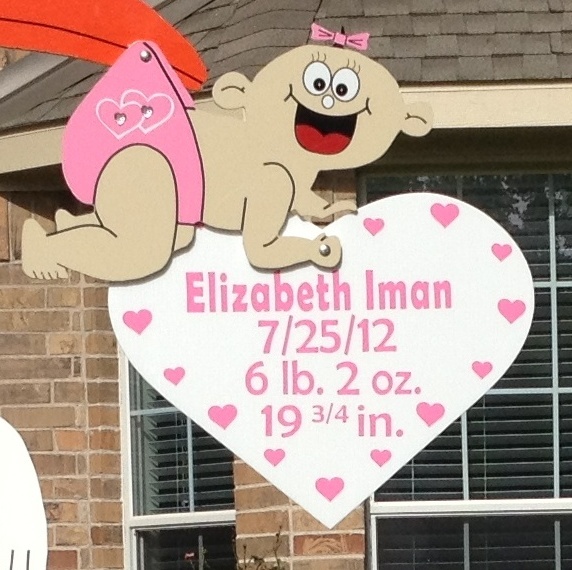 If you have a brand new baby and would like to rent one of our adorable Stork Yard Signs, please fill out the Stork Reservation Request. Optional Upgrade Keepsake: Our Adorable Teddy Bear Keepsakes! 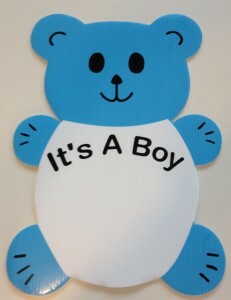 Our teddy bear keepsakes are adorable & great for several uses! Upgrade your personalized keepsake from a star or heart to our adorable teddy bear keepsake for only $10. Order for your hospital door & just fill in your baby’s information! 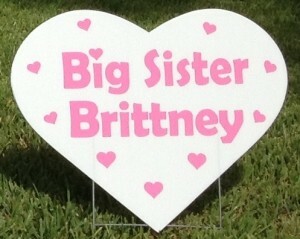 Hang on your apartment door, house door or in your baby’s room! 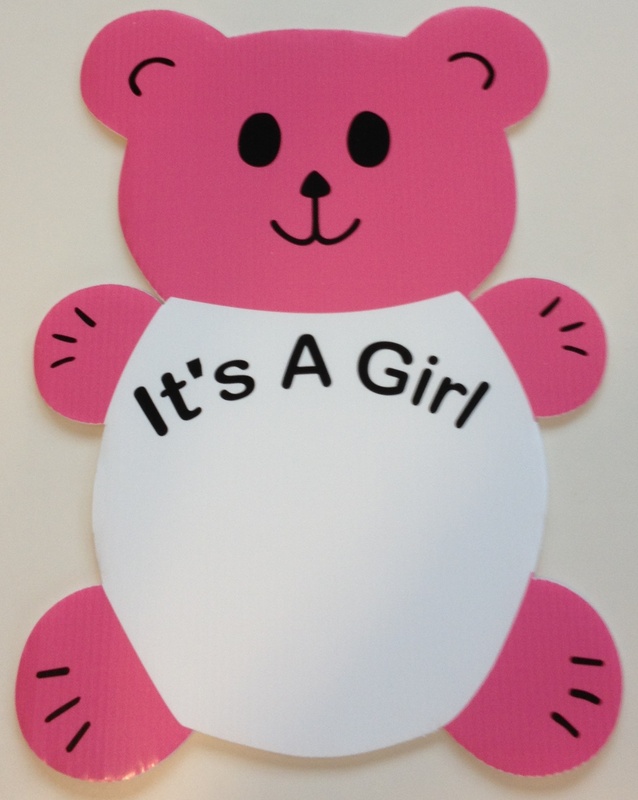 We sell our teddy bear, star & heart keepsakes without the rental of a stork. If you would like to just purchase a keepsake, please contact us for details. Local pick up is available in League City, and we ship nationwide. 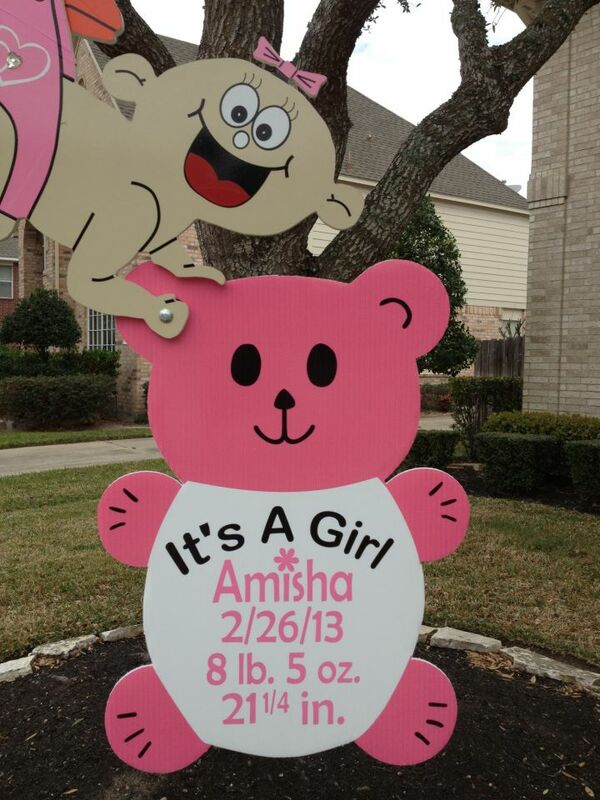 If you deliver at a local Clear Lake Hospital, delivery may be available for an additional fee. What a fun alternative to sending flowers!! Don’t forget to include the older siblings. 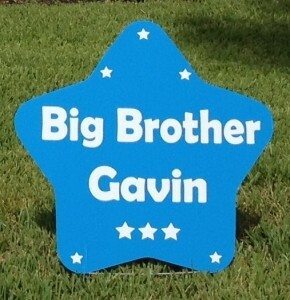 They will feel special when you include a personalized big brother or big sister sign just for them. We will leave it as a keepsake at the end of the rental period. Baby Shower Stork Yard Signs!! 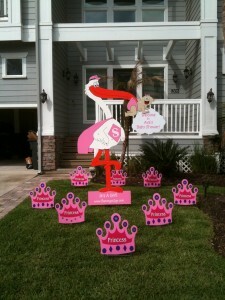 We can help with a little decorating at your baby shower! Baby Shower Stork Yard Signs are a great way to surprise the mommy-to-be and also show your guests where the baby shower is. It makes a wonderful decoration. 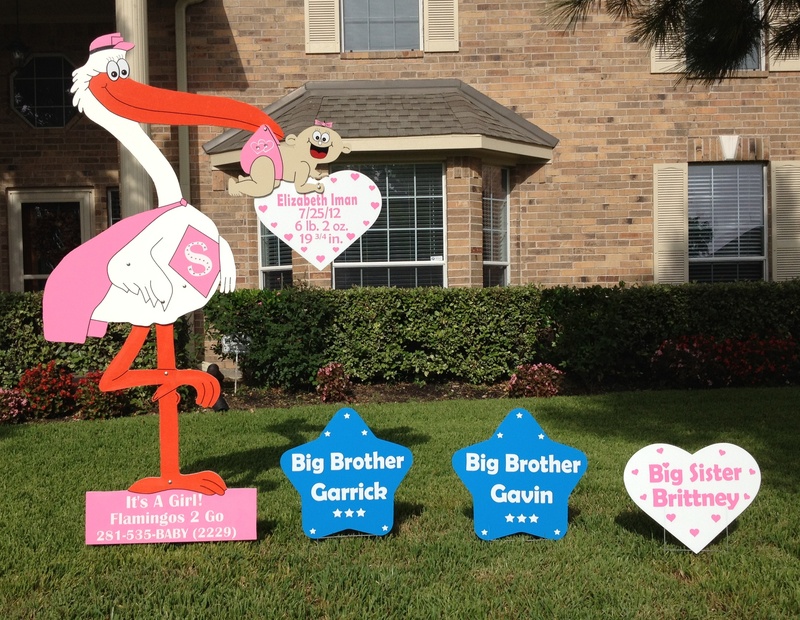 Shower Stork Yard Signs are typically rented for one day. Additional decoration options are also available. 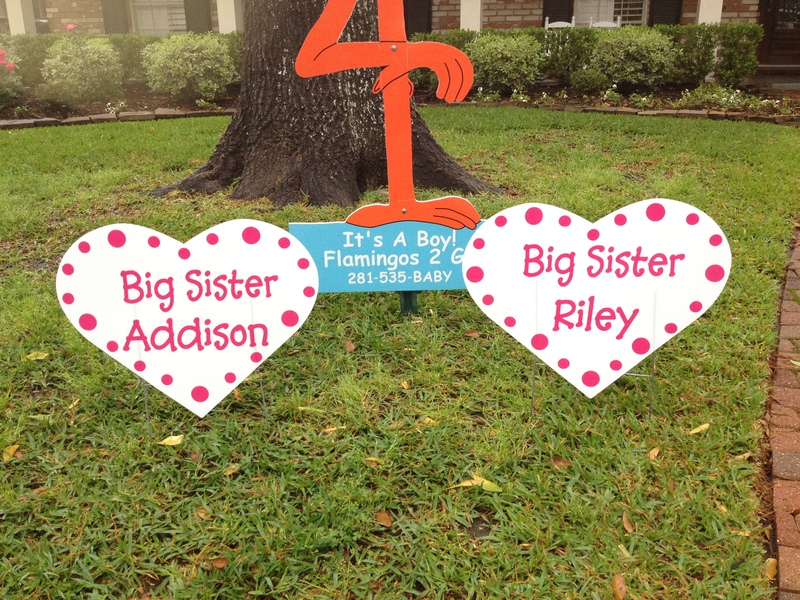 Stork Yard Sign Rentals are also a great gift! 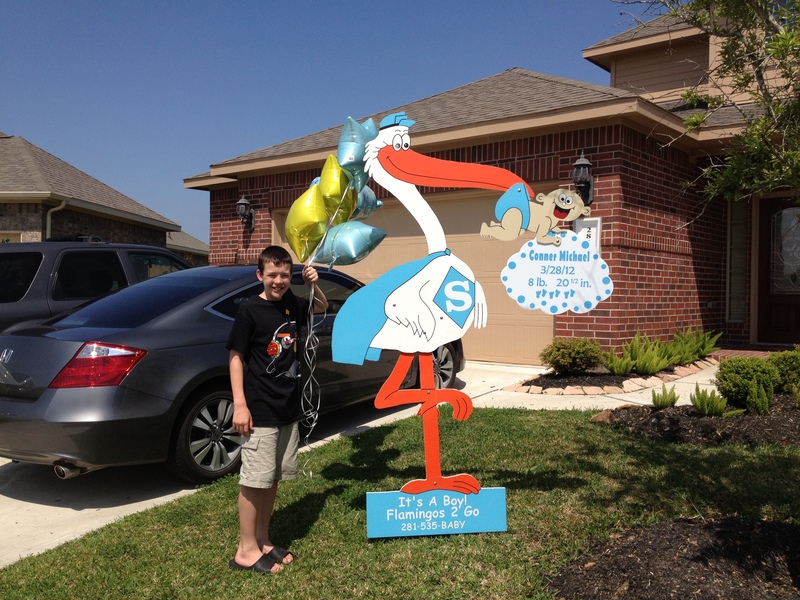 Check out the Stork Photo Gallery!